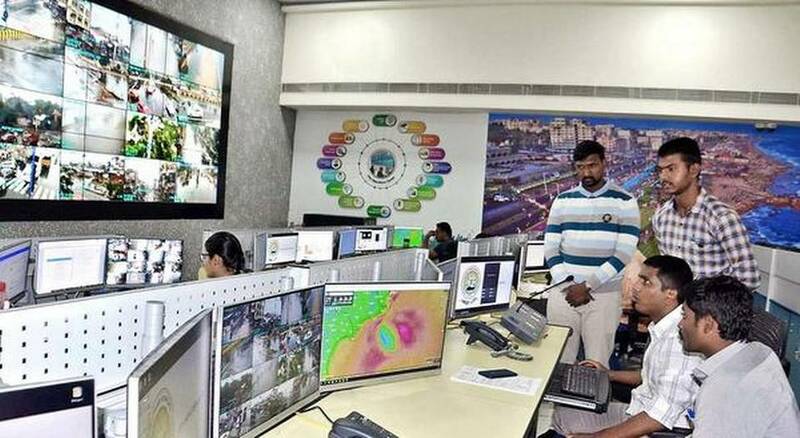 The Command and Control Centre (CCC) set up by the Greater Visakhapatnam Municipal Corporation (GVMC) here as part of the Smart City initiative, proved its worth on Monday, when Phethai cyclone made a landfall near Kakinada in East Godavari district. Functioning round the clock, the CCC played a major role in monitoring the movement of cyclone and rehabilitation activities undertaken in various areas in the GVMC limits. A team of around 10 staffers, who work in two shifts, continuously made announcements about the cyclone and its movement through Smart Utility poles erected at major junctions in the city. They also started cautioning people about the dos and don ts such as to avoid driving on the roads, not to stand under trees, not to venture out in the high winds and etc since Sunday evening. GVMC Commissioner M. Hari Narayanan monitored the ongoing rehabilitation works and instructed the ground staff time to time on Monday. Surveillance cameras were used to monitor uprooted trees, road blockages, water stagnation in many areas. We could contact all our staff and issue alerts. Apart from our staff, we sent alerts to Resident Welfare Associations (RWA), Self Help Groups (SHGs). The environmental engineer at the centre was studying the weather models to give updates on the conditions, Mr. Hari Narayanan said. The CCC have started its full-fledged operations. This is our initial experience with the system during emergency and we will build on from here, he added.